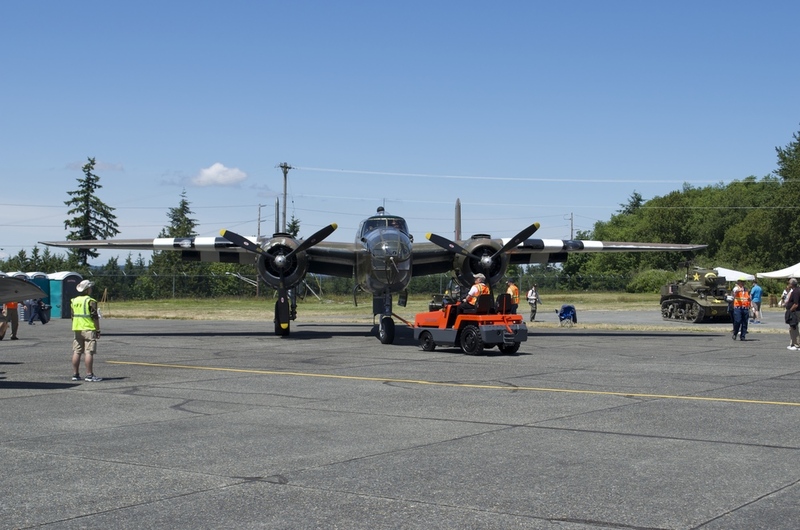 A tug tows "Grumpy", the B-25 Mitchell, into position for takeoff from the Historical Flight Foundation at Paine Field. Communities the world over are recognizing the 70th anniversary of the Normandy invasion this weekend. While Seattle is a great distance from the beaches of France, the area’s connection to D-Day is much closer than one might think. The history of aviation in the northwest includes strong links to the Second World War. John Sessions, CEO of the Historic Flight Foundation, had graciously invited me to fly with him during the D-Day commemorations at Paine Field on June 7. John has put considerable effort into restoring vintage planes to flying condition and every one in his collection has a fascinating history. This was an uncommon opportunity to fly in a WW2 plane as part of the elaborate weekend of events organized by the Foundation. The hangar that houses the collection was largely emptied of planes and featured historical displays from the war, many of which had men and women in period uniform sharing stories. At one end a band played popular music from the time as spectators of all ages sat at tables and enjoyed their lunches. 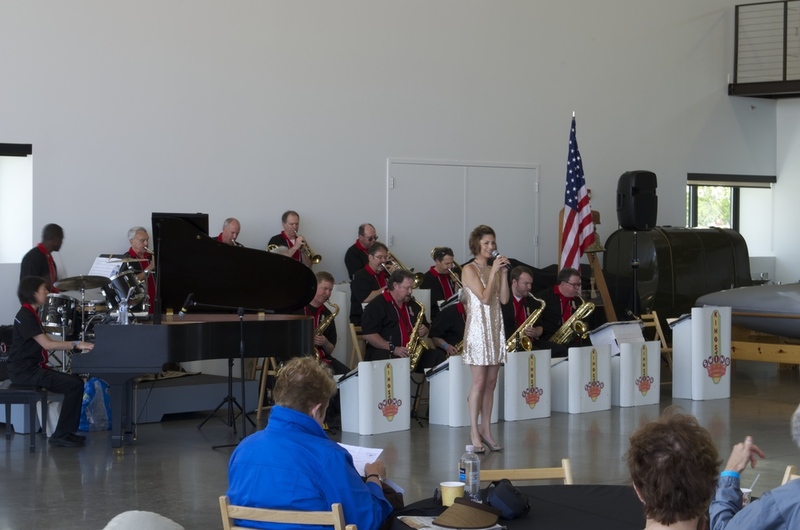 A swinging rendition of “Sentimental Journey” poured out into the sunshine as I arrived. The Kings of Swing kept things lively. 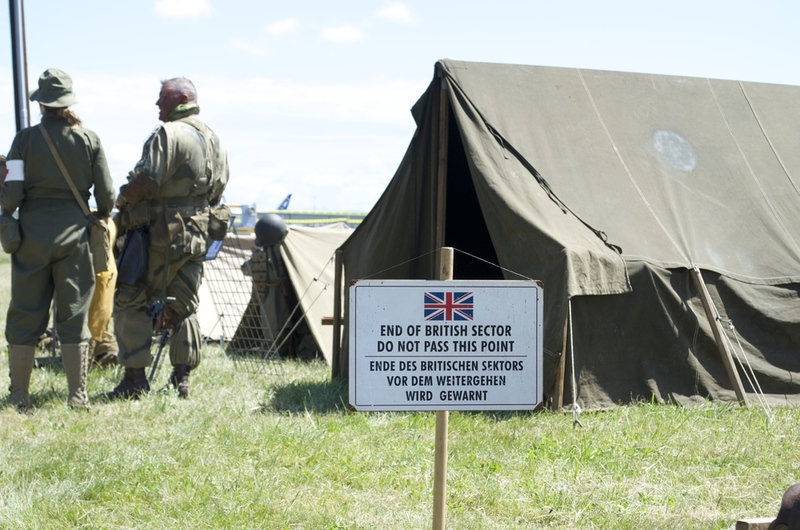 The field behind the hangar was filled with exhibits of vehicles, weapons, encampments, and scenes from the war. At the far end a group of U.S. Army Rangers from Fort Lewis were showing their lethal arsenal of rifles to a crowd eager to handle the well-worn firearms that had been used in recent conflicts. Right then, I suppose we'd better turn back here. "And this one, lad, was the preferred bayonet for charging the Nazi lines"
The genuine articles. All males at this table for some reason. Stationed on the apron was an impressive array of aircraft, vintage and modern. The stars of the show were the P-51 Mustang, “Impatient Virgin”, which flew four sorties during D-Day (and which John & co. had unearthed from a beet field in England) and the B-25 Mitchell bomber, “Grumpy”, the plane in which I’d be flying. Nearby the Rangers had parked a pair of helicopters and invited visitors inside to check them out. The "Impatient Virgin", left, survived D-Day only to meet an ignominious demise after the war in a field. She's now restored to wartime glory. The Rangers' Chinook: each rotor blade is about 2 1/2 feet in width. All the better to see you with, my dear. Meanwhile, operations continue at the Boeing plant in the background. At 12:30 the small group of lucky passengers gathered for our pre-flight briefing. John and co-pilot Eugene told us about the plane. It’s the oldest B-25 still flying and was used for coastal patrol and firefighting after the war. John gave us a preview of the flight and described the maneuvers he was planning: a series of banana passes (gentle arcs) followed by a couple of wingovers, where the plane climbs into a steep vertical bank. We’d be buzzing the airfield at 300mph. Climbing aboard and strapping ourselves in the excitement mounted. “Don’t pull any red levers,” John instructed. "When the bell goes off, don't jump out of the plane." I don’t have a strong personal tie to D-Day. My paternal grandfather served in the English army during the war. While Allied troops were crossing the Channel he was sweltering in the jungles of Burma fighting the Japanese. I think he would have appreciated the event put on by the Foundation and, after all, the B-25 we’d be flying was part of the Royal Air Force. I wore my grandfather’s belt for the day so a small piece of his life could be part of the celebration. The flight was breathtaking, set to a soundtrack of screaming Cyclone engines. We flew close to the ground, certainly close enough, and enjoyed spectacular views over Puget Sound, the neighborhoods below, and Paine Field. After our rollercoaster ride above the airfield John turned the bomber east and flew us over farms and forests to the slopes of Mount Pilchuck. The bail-out bell signaled we could unbuckle and move around- I opened some windows for clearer photos and we took turns climbing up into the gun turret. The Rangers selected their youngest member as a passenger for the flight. Circling Paine Field- B-52 on the grass among the commercial jets being prepared for delivery. On our return journey we passed above the site of the Oso landslide. Even from the air the scale of it was difficult to grasp. Climbing down the ladder back onto the apron everyone had grins to match the bomber’s wingspan. That flight, while missing the gravitas of an armed sortie above Germany, gave us all a deeper appreciation for what the aircrews of the time experienced. This was a machine that helped to win the war. I’m grateful to the men and women of the time whose efforts secured our victory and also to the Historic Flight Foundation for keeping these memories not only preserved in a museum, but alive and flying. The destruction is hard to comprehend, even when seen from this perspective. Restored, but not too much.